As part of our commitment to corporate social responsibility we like to spend time raising money for good causes. You can read more about these in our Media Centre. We hold quarterly charity events at the office and our employee-driven charitable activities outside of work keep us busy. So much so that employee contributions to various charities were £19,486* since 2013 (as of June 2018). In 2017, the reigns were handed over to each division to hold a charity day for a charity of their choosing. The Specialist Services division were first to host an Australian themed charity day including an Australian themed quiz, Australian wine tasting, Aussie treasure hunt and of course, a BBQ! The team raised over £500 for the UK’s first child bereavement charity, Winston’s Wish, who have been providing support to children who have lost one or both parents since 1992. 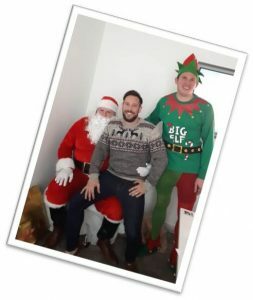 The Care Home division were next up to host in December 2017 with a festive themed day for charity Community Christmas, whose mission is for no elderly person to spend Christmas Day alone. The day began with a visit to “Santa” and a Christmas jumper competition, followed by a gingerbread house contest and Christmas quiz. A delicious lunch of Christmas turkey baps with all the trimmings was served with some warming mulled wine. Overall, we raised an incredible £900 for Community Christmas. Also in December, our Manchester office held a bake sale, guess the sweets contest and like the Portsmouth office, a gingerbread house contest. In total, they raised over £600 for Target Ovarian Cancer. 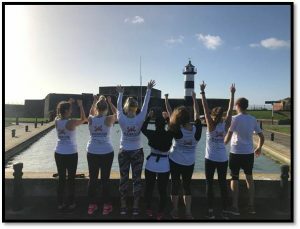 No year at Compass Associates is complete without an entry into the Great South Run business challenge and 2017 was no exception, with our team of 8 runners taking on the 10 mile course around Portsmouth and Southsea raising over £1000 for local cancer charity, Harbour Cancer Support. 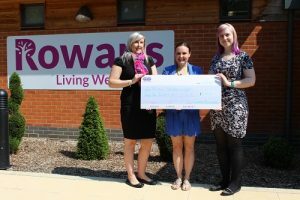 Employees were responsible for raising £3,035 last year for charity. Overall, in 2017 we raised £4,824 including donations from outside of the business and company matched donations. 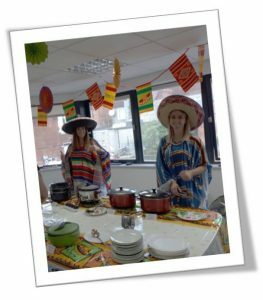 In 2018 we held our most successful internal charity day, a Summer Fete with a Mexican twist, hosted by the General Healthcare and Business Support teams for the Rowan’s Hospice raising an impressive £1262! In tandem with our fundraising efforts, we have also continued to support Care Home Open Day since it’s inception 2013. Compass Associates employees have volunteered at numerous Care Homes helping serve food and drink, spend time with residents and their families and even treating them to a song or two! Moving forward we will continue to support charities that are close to our hearts in the markets we serve. We are also excited to be offering employees the opportunity to donate their time to worthy causes volunteering in the community, watch our media centre for more information.